The Sage 200 Transaction Enquiry is a useful feature designed to provide assistance with financial investigations and account balance reconciliations. This feature is available from many areas of the core Financials suite of modules; Sales, Purchase and Nominal Ledgers and also within the Cash Book. There are various types of Reconciliation features available within Sage 200. Last year we wrote about the trusted Creditor & Debtor Reconciliation Enquiry which enables users to reconcile their Aged Creditor and Debtor balances with the associated Nominal Accounts. 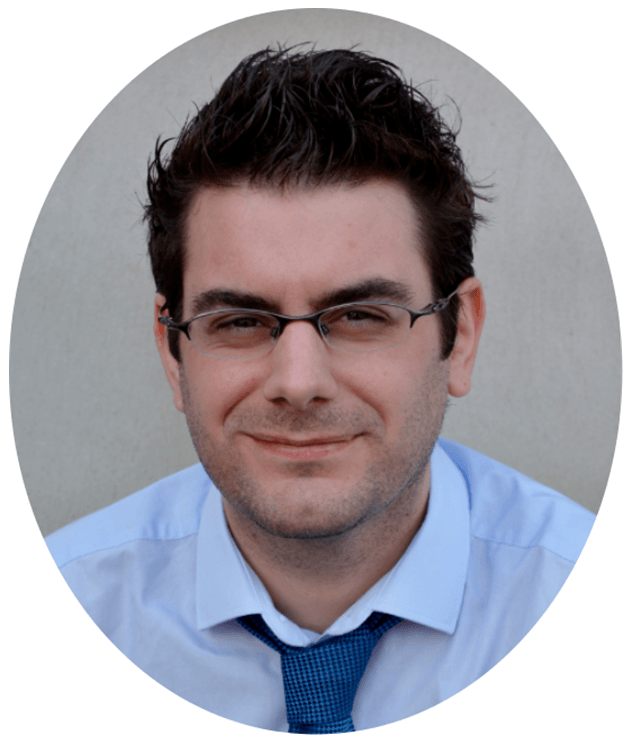 Earlier this year we wrote about how to get more out of Sage 200 Business Intelligence – the powerful and increasingly popular extension to MS Excel with a focus towards strategic company data analysis. Cue the long-standing Transaction Enquiry for Sage 200. Use the Account drop-down lists to locate your Customer account – Wildcard Symbols can be used here to save you some time. 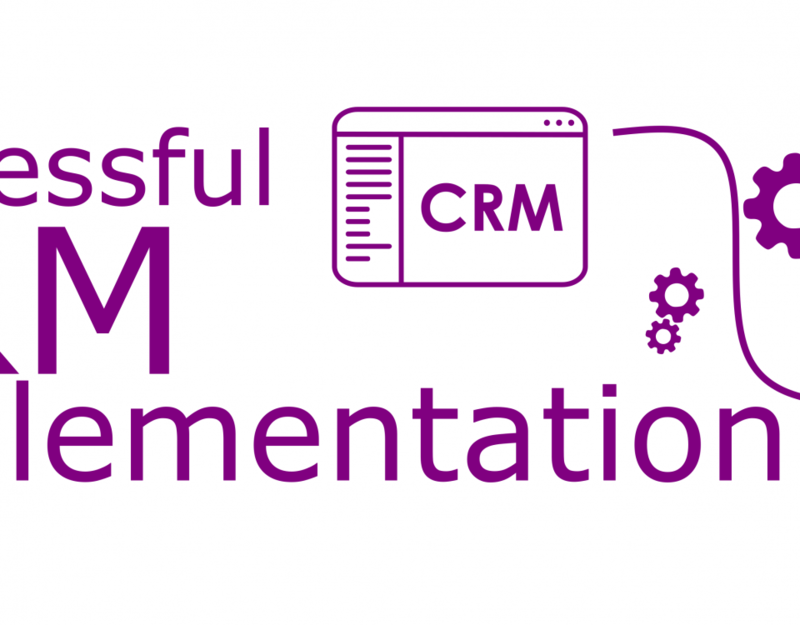 Selecting a Customer account will populate the form with various pieces of information that Sage believe could be useful to you in your investigation. Questioning and understanding the information presented within this form is crucial to the understanding and managing of your transactions within Sage 200 Transaction Enquiry. A ‘Current’ transaction is one that has not been archived, once a transaction has been archived it resides in the ‘Historical’ part of the Sage 200 database. Transactions can be archived periodically or in fact at any time and this can make the system a little more efficient for businesses with a high-frequency of transactions. However, generally speaking the archiving feature is not used regularly as these ‘archived’ transactions need to be enquired and reported upon a little differently. When you are accessing the Transaction Enquiry for the first time there are a few important items to point out. Current/Historical Transactions – By default you will be presented with Current Transactions i.e. those that have not been archived. Selecting the Historical tab will present you with a list of archived transactions. Show Outstanding Only – Whilst this tick box is selected only outstanding transactions will be presented in the list. 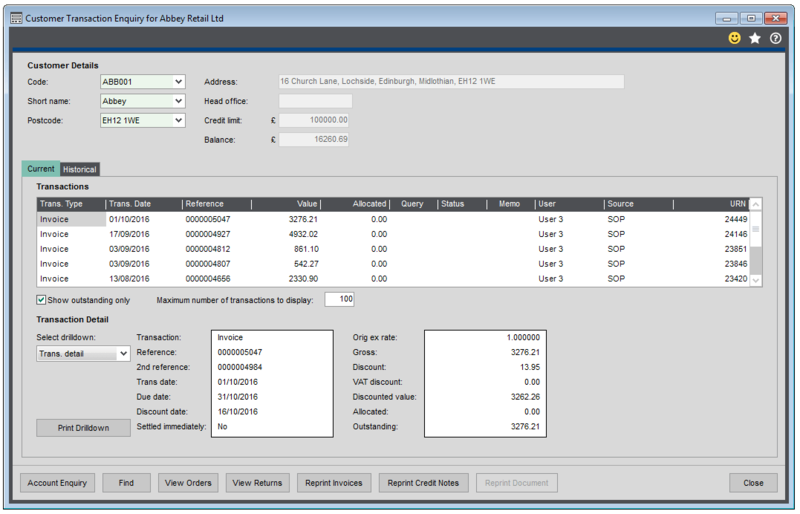 Maximum number of transactions to display – The Transaction Enquiry feature places a looking glass to the recent transactional activity within your business and it does this very well. By default the ‘number of transactions to display’ value will default to 100 so you may wish to increase this if you don’t immediately find what you’re looking for. Selecting the transaction from the list above will populate this Transaction Detail area with lots of important information. By default this will show you the summary transaction information such as references, dates and values. For example selecting the Nominal item will present you with a list of all of the nominal postings that have been made for the highlighted transaction. 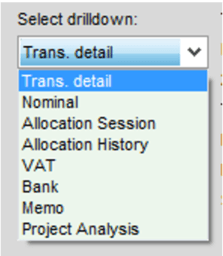 Select the Print Drilldown button to print a summary report of this transaction. If you have already invested in Sage 200 and have only recently discovered this Transaction Enquiry feature then I hope this blog has helped. For those that are considering investing in Sage 200 I hope this demonstrates yet another useful feature available in Sage 200, which enhances this dynamic and powerful solution.